This easy to read informative book is written by Alis Rowe, the founder of The Girl With The Curly Hair. There are many different books available on autism spectrum conditions, but not so many which are written by those who have an Autism Spectrum Condition themselves, so that makes this book all the more helpful. Unless you experience first-hand you can never fully understand, so the best resources and research you can find are those that are written and offered by those the condition themselves. Alis gives a real insight into Asperger’s syndrome and some of the hurdles teenagers with the condition may face. With this book focusing on the early teen years, age 13-6 years, it gives a more direct look into Aspergers and what that can mean for this age group. Not only does this book offer information, reassurance and comfort to those with Asperger’s themselves, I also think this book could be a great help in allowing parents, siblings and family/ friends of the person with Asperger’s to grasp a better understanding. 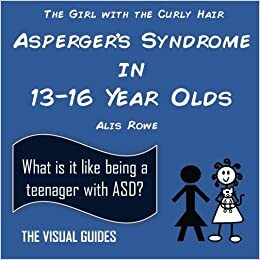 Asperger’s Syndrome In 13-16 Year Olds, is written in such a straight forward way, it’s a very easy read but it still manages to focus on so much valuable information. It really gives you a clear idea of what living with Asperger’s can be like and it encourages you to learn about the similarities and differences between people who are neurotypical and those who have an ASC. Alis Rowe has given some useful advice and reminders, which will be really helpful to many. Alis has also encouraged the readers to see that difference is not wrong; it is something that a person should be aware of and there can be many positives with being different. She has included a very simple but effective illustration of an example of thinking in an alternative way, which shows that difference is something that can be embraced. This illustration also includes the caption “She sees the world differently”. It’s almost as if this book has been stripped of unnecessary detail, which allows it to focus on key points and key messages, which is extremely beneficial. Alis talks about many aspects of having AS, including: sensory challenges, friendships, feeling lonely amongst others, the stresses of the school environment, the difficulties of the journey of adolescents, special interests and why those with AS might have some, or all, of these differences and challenges. I think this book is a must have for all teenagers with Asperger’s syndrome who are feeling confused and alone in being different. I am a speech and language therapist who sees children with ASD and/or complex communication difficulties including selective mutism. If I was in the NHS I would be called highly specialist. I see children who have many challenges, some of which are speech, language and communication but many also have extreme anxiety. It's a chicken and egg situation because if they didn't have Speech, Language and Communication Needs, they wouldn't be so anxious, if anxious at all, while the anxiety blocks their abilities both to understand and to express themselves. Therefore, to do my job properly, I have to know about anxiety and be able to address some of the issues alongside. Consequently, have studied and I use animal assisted therapy (AAT), CBT and NLP as part of my approach with traditional approaches including Social Thinking by Garcia Winner. I discussed this recently at a RCSLT clinical excellence network. The responses were very interesting: completely polarised. Almost half the audience wanted to know more, took the references and 'where to go from here' information readily, the other half raised their eyebrows and shook their heads. There is a wealth of clinical evidence about all the approaches for counselling but they were disturbed because there isn't in speech and language therapy. I use the animal assisted therapy by having Ralph (a certified PAT dog) in on sessions where I need the child/teenager to be relaxed so I can get on with the 'other stuff'. It works like a dream as he sits by them while they answer my questions or complete assessments. They can stroke him or ruffle his neck as they think or cry into his neck if they feel like it....he doesn't mind a bit. The CBT is really just looking at the problem and breaking it down into baby steps, which is actually what most speech therapy is, while the NLP helps to shift negative mind sets. The Social Thinking is a brilliant way of introducing the idea that social cognition is a vital area for us to get along with our fellow man even if we never wish to have a conversation with him. I believe that we need to be more creative: there is no one-size fits all approach to these children and young adults. They've usually tried everything else by the time they come to me. I know this blog-post will receive a polarised response too but I make no apology because my goal is to make a difference and not be just another professional who says they can't help because they don't fit traditional methods. As the saying goes: if we always do what we've always done, we'll always get the same results. We're lucky because we are not bound by commissioners or bureaucracy which imposes limits on what we do. As a team, we have a wealth of clinical based evidence and that's sufficient for me: we achieve good, if not great, results!